The Roman fort at Binchester lies above the River Wear just outside the historic town of Bishop Auckland (Co. Durham). Known to the Romans as Vinovia, it commanded the main road that ran from the legionary headquarters at York northwards to Hadrian's Wall. 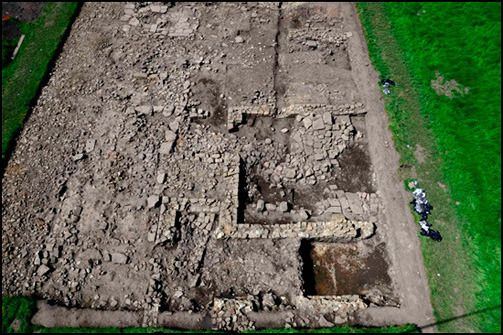 It formed a key element of the complex frontier system that lay both sides of the Wall that marked the northern-most edge of the Roman Empire for nearly four hundred years. The fort itself was built to house a cavalry regiment in the early years of Roman control in Northern England. It housed troops from across the Empire, including Spain and Germany. It was not just a military site, a thriving civilian settlement (vicus) grew up at its gates. Today traces of the Roman ramparts and road can still be seen, and the remains of the commander's house have been uncovered. These contain the best-preserved Roman bathhouse in Britain. Since 2009, working alongside Durham County Council, Texas Tech University, Vinovium.org and the Archaeological and Architectural Society of Durham and Northumberland we have been excavating two trenches at the site, one within the fort and one within the vicus. These investigations have uncovered substantial remains dating to the late Roman period, including a barrack block, a latrine and parts of an impressively well-preserved bath-house and significant assemblages of faunal remains, pottery and other artefacts. Major finds include the stone head of a Roman god and two stone altars. A major campaign of geophysical survey in the immediate hinterland of the site has revealed extensive Roman activity across the gravel plateau on which Binchester stands. The excavation has been funded by Durham University, Durham County Council, Stanford University, English Heritage, Vinovium.org and the Roman Research Trust. Please visit our blog for more information about this exciting project. Petts, David (2013). Military and Civilian: Reconfiguring the end of Roman Britain in the North. European Journal of Archaeology 16(2): 314-335.